Hi everyone! 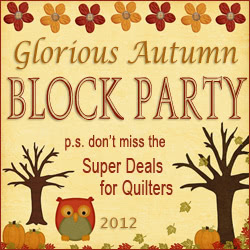 Welcome to Block 16 of our Glorious Autumn Block Party. 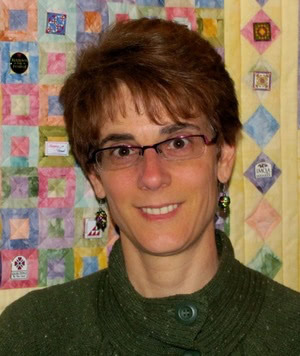 Today we have Jackie Kunkel as our featured designer and the Fat Quarter Shop has a fabulous Super Deal. Be sure to check out Jackie’s give-away too! 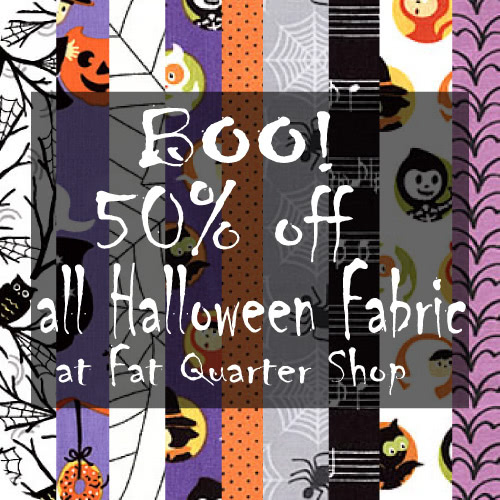 50% off all Halloween Fabric – over 250 fabrics! Use coupon code: ghost. Ends Tuesday 9/16 at midnight CST! I blame it on my hubby and that is a good thing! I actually have been sewing since I was in 6th grade in Home Economics. I have always done garments. Then when I was pregnant with our first child, my husband suggested I get a hobby since I would be staying home with our children and I might become bored… LOL! So in 1993, about 19 years ago, I took my first “official” quilt class. My verdict was that I didn’t like it. The teacher wanted us to use scissors and cut templates from cardboard. I thought there was a quicker way, but she wouldn’t show us. Needless to say, this class project never was completed. But I pressed on and found another quilting class where we used a rotary cutter and ruler… I was hooked then!! I made a Quilt in A Day Star Log Cabin. I no longer have this quilt as I gave it away as a gift. But technically my very first quilt project was from Home Economics. 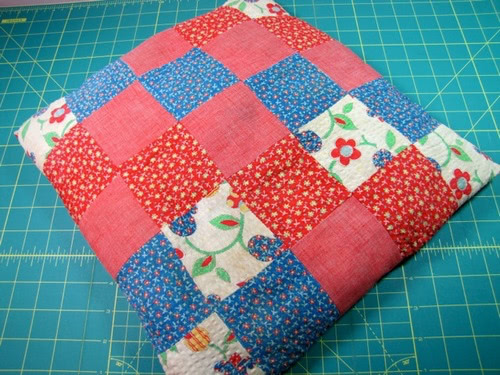 I still have my first patchwork pillow and it is in pretty good condition too! About 3 years ago, I consciously decided to push the envelope, I knew I could do it after quilting for so many years. 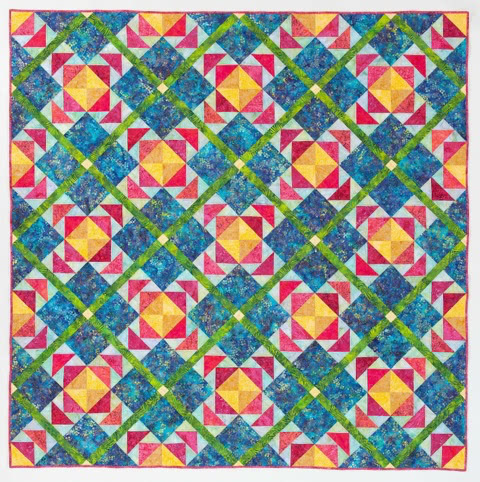 I approached Quilt Magazine at Quilt Market and began submitting designs. They liked my designs and I have been designing and publishing every since. I enjoy it too! I think my current favorite design is my Island Breeze quilt. I like this one for several reasons. 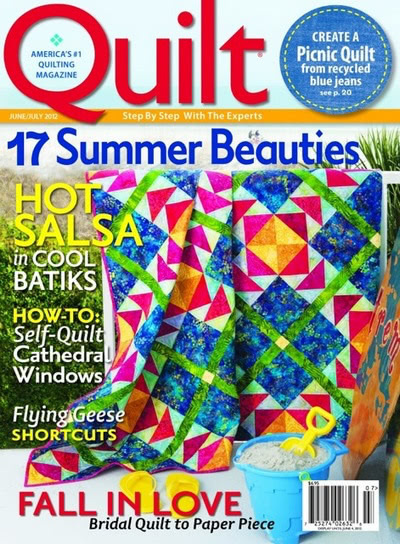 I designed it, I love batiks and the colors I chose, and the fact that it landed on the cover of Quilt Magazine this summer! Wahoo!! How many UFOs do you currently have? Don’t ask… not too sure I can count that high. What size of quilt do you prefer to make/design? (e.g. table runners, lap quilts, bed quilts, etc.) Well… I usually do big. So mostly double size or higher. 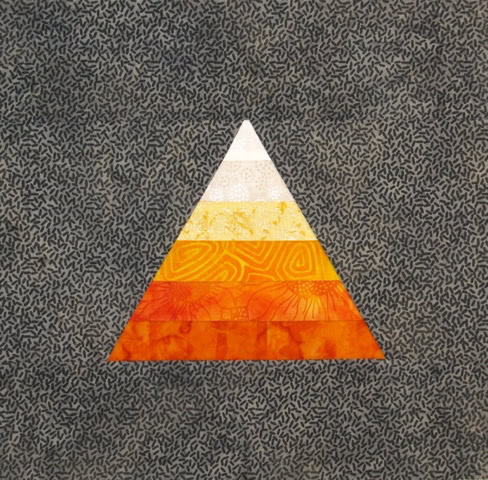 Not sure why, I like it that way, I just do. What colour do you use most often in your quilts? Pink… If I can find a way to put it in there I will. And not just any pink… hot pink or fuchsia. Favourite one-sentence tip for a new quilter: Never stop taking classes, if you learn at least one new thing the class was totally worth taking. Favourite size and brand of rotary cutter: 60 mm Olfa ergonomic. Here’s Jackie’s block: Candy Corn. She’s included a great photo tutorial on her blog for putting together this block and making a couple of cute place mats. View the tutorial here! See the previous 15 blocks here! 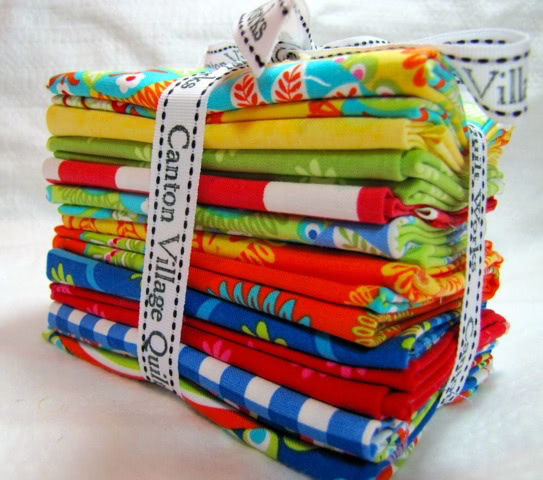 Jackie is giving away 10 fat quarters of Gypsy Bandana fabric. Head over to her blog to enter the give-away.